The ancient city of York in the north of England is famed for several reasons. There is medieval and Gothic architecture, York Minster cathedral, the Jorvik Viking Centre museum, railways, a university, rivers, countryside access and the (probably apocryphal) reputation of having more pubs per square mile than anywhere else in this thirsty country. But today York is adding another chapter to its seething history as the home of Anaplan. This is a small company today but growing remarkably from its home in York proper. Although headquartered in San Francisco, R&D comes from this unlikely spot that is home to co-founder and CTO Michael Gould. What does Anaplan do? You might think of the company as attempting to do for business planning — or corporate performance management, to give it its old-school name — what Salesforce.com (an Anaplan investor) did for CRM or Workday (another Anaplan stakeholder) is doing in human resources. That is, providing a modern, cloud-based approach and applying the knowledge of people who have plenty of experience of how tasks were done in the past. Gould, having worked for Adaytum and seen it swallowed by Cognos in 2003, was ready for a new challenge when he set up Anaplan in 2006. Gould’s notion was to provide the ease of use of Excel with the power and breadth of a corporate performance management tool. Addiction to Microsoft Excel aside, there were also the old corporate performance management solutions, often used alongside business intelligence or reporting tools. Software giants also then acquired tools for predictive analytics and so on to create complex stacks and suites. This sent many users back to using Excel and the unintended consequence was lack of order (spreadsheets everywhere with little synchronisation or version control), limited capabilities and, hence, reduced visibility. “The traditional tools were focused on IT with scripting language involved and our key premise is to make a user experience that is accessible to the business user,” Gould says. Complementary analysis tool makers like Tableau and QlikView are both customers and share an outlook with Anaplan. Gould says that while the likes of QlikView can deliver fast results so the business user “doesn’t have to wait two months”, Anaplan lets companies keep scores on their performance across the full gamut of functions via a spreadsheet-like user interface. Although the edges of the Venn diagram might intersect, Anaplan is not a BI tool but a service for business planning including sales, finance and workforce management. Organisations need to get better at planning because business is faster now, he adds. Anaplan’s approach is winning the company accolades from big VC stakes (it’s raised $150m), to praise from the likes of Workday co-CEO Aneel Bhusri who named Anaplan as a company that excited him in a recent interview with Fortune magazine. It’s also generating the usual mudslinging from big software companies that are perhaps its closest competition and who argue that Anaplan is too tiny and will end up being acquired. “Classic FUD,” says Laluyaux, who took the reins in early 2012 after a career at business software companies including Business Objects and SAP. The company had 25 staff two years ago, has 250 now and expects the ranks to swell to 380 this year with operations in 10 countries. It is raking in about $10m per month selling direct to what it says are often hyper-growth firms or “hyper-change” companies like HP and Dell, forced to react to new economic and competitive realities. Anaplan’s funding will be needed for it to compete with the big boys. The strategy is classic “land and expand”: get into accounts and then depend on users to recommend it to other departments — the formula bottled by Salesforce.com. “We allow even very large companies to start small. We want users to love it like the way users love Splunk or QlikView. If the end user is not super-happy, pft…” he tails off with a Gallic shrug. 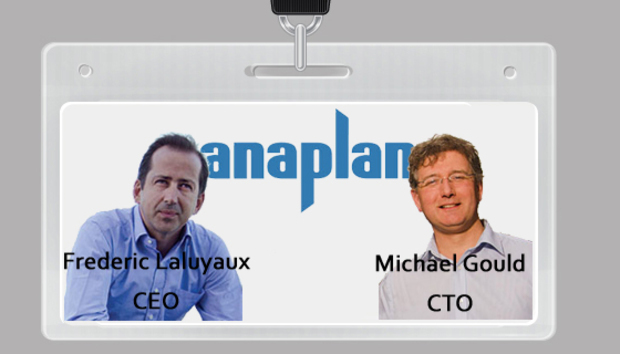 With Anaplan growing fast, you might expect M&A interest from those big rivals but Laluyaux says a sale is not on the cards.